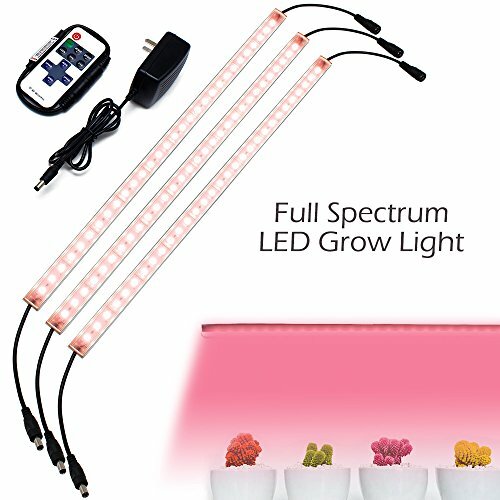 Hard LED Grow Light Strip with Full Spectrum LEDs, 36W IP65 Waterproof Dimmable LED Plant Grow Light Bar for Germination, Growth and Flowering, with 12V/3A Power Supply, Set of 3, All in Kit by LEDLampsWorld at Buy Online Guru. MPN: LLW-FSLGS-3-RW. Hurry! Limited time offer. Offer valid only while supplies last. Full spectrum LED grow light is now available! Wanna something to provide all aspects of care for your lovely little plant? Here is the answer! Full spectrum LED grow light is now available! Wanna something to provide all aspects of care for your lovely little plant? Here is the answer! This LED grow light could produce lights of all kinds of wavelengths(400nm-800nm) that plants need. Lights of wavelengths between 400nm-520nm and 610nm-720nm are highly demand in most stages. Lights of wavelengths between 720nm-800nm could accelerate sprouting of seeds and flowering of plants. No matter your plants are in sprouting, growing or blossoming, it could always provide a suitable brightness for your plants. It's time to take the sweetheart of plants home! Each hard grow strip light includes 30 powerful LEDs, provide enough brightness. The remote controller has 10 dimming levels from 10% to 100%, meeting the daily needs of plants. The control range is 32 yd, you could turn on/off the lights any time you want. All you need to do is press "SPEED -" and "SPEED +" at the same time for several seconds. The light would quickly flash for three times, that means the remote controller has made a connection with the LED Controller again. Then you could use the remote controller to control the light again. If those above steps could not solve your problem. Then it's time to tell us about the problem, we would send you a replacement. Apply to Most Plants: This full spectrum LED grow light produces lights of all kinds of wavelengths plants need in sprouting, growing and blossoming, just like the sun! Suitable for most plants, don't need to think about which wavelength of lights would fit your plants, this grow light will solve this problem for you. More Effective Than Red and Blue Mixed Light: Produces all wavelengths of lights(400nm-800nm). Not only produces the lights of 400nm-520nm and 610nm-720nm wavelengths that plants need most, but also produces IR lights(720nm-800nm) which could accelerate sprouting of seeds and flowering of plants. More effective than red and blue mixed light during the same lighting time. Dimmable with High Brightness: Each hard grow strip light includes 30 powerful LEDs, provide enough brightness! Remote controller has 10 brightness levels from 10% to 100%(10% as a level), meeting the daily needs of plants. Control range of remote controller is 32 yd, which means you could adjust the brightness level and turn it on/off without leaving your work. Easy to Install: Just simply stick the hard grow light strips under somewhere you want, then plug them together, then you could start enjoying culturing your plant! Wide Application: Used as plant growth supplementary lighting. Widely used in vegetable greenhouse, vegetables and fruits, floriculture, propagation, city farming. 1 year warranty. View More In Growing Lamps. If you have any questions about this product by LEDLampsWorld, contact us by completing and submitting the form below. If you are looking for a specif part number, please include it with your message. 2018 New LED Grow Lights, 8W Indoor Plant Light, Desk Clip Plant Grow Light with 360° Flexible Gooseneck ，Super Long Cable with Spring Clamp for Indoor Plants Hydroponics Greenhouse Gardening Plant.